In the United States, the fastest-growing companies are middle-market businesses with revenues of between US$10 million and $1 billion. This group of 200,000 companies accounts for roughly one-third ($5 trillion to $6 trillion) of total U.S. private-sector GDP (pdf). Big enough to be resilient when challenged and have resources to invest, yet small enough to have plenty of runway, they consistently grow faster than either their larger or their smaller counterparts. The best among them set themselves apart by how well they understand how they want to grow. Whether it is evidenced in their strategy for investing or their penchant for cost cutting, they are in tune with their own strengths, weaknesses, and appetite for risk. They use this knowledge to devise customized recipes for growth and shape their decisions about markets and initiatives. At the National Center for the Middle Market, where I am executive director, we know this because every quarter we survey 1,000 U.S. midsized companies out of our total database of 20,000 companies, tracking hundreds of data points on performance, growth, investment activities and plans, employment, and the like. The resulting Middle Market Indicator (MMI) shows that revenue for U.S. middle-market companies has grown at an average rate of 6.5 percent per year since 2011, compared with average annual growth of 3.6 percent for the S&P 500. Using Bayesian network analysis (see “Research approach”), we were able to characterize three types of fast-growing companies by the emphasis they put on the different growth factors, the relationships among the different factors, and the actions the companies take on the basis of these relationships. The research was completed using Bayesian network analysis by the National Center for the Middle Market, RTi Research, and Jay Anand, the William H. Davis Chair and Dean’s Distinguished Professor of Strategy at Ohio State University’s Fisher College of Business. Bayesian network analysis uses a statistical technique that shows the strength of relationships between various measures and a “target” metric, in this case, growth. The researchers identified clusters of companies that assembled the growth factors in similar ways and, as a result, achieved rates of growth exceeding that of the average middle market. Looking more closely at the top performers, they found they excel in each of the seven growth factors, though not all in the same way. 1. The Investors. Members of this group reveal who they are because their first question is “What’s the opportunity?” They willingly put their capital to work across a spectrum of growth-producing activities. 2. The Innovators. For this group, the go-to question is “What’s next?” They win customers and greater share of wallet by being first to market with unique or improved products and services. 3. The Efficiency Experts. These companies start out by asking “What’s the plan?” This group achieves superior growth by maximizing return on investment through a combination of lean operations, effective cost management, and rigorous long-term planning for sustainable growth. The lines between the three types are not crisp; they are points of emphasis, not delineation. Companies often straddle the boundaries between types, and it’s possible to major in one and minor in another. Although the Investors and Innovators display similar profiles (for both groups, market expansion is the key catalyst to growth), the factors that fuel their market expansion are somewhat different. For example, solid financial management and formal growth strategy both have direct links to market expansion in the Innovator model that don’t appear in the Investor map (see “What the fastest-growing middle-market companies focus on”). Efficiency Experts display the most distinctive profile; for them, the roads to growth all converge in formal growth strategy. Two drivers — cost efficiencies and financial management — connect more directly to formal growth strategy for Efficiency Experts than they do for the other types. A management team that understands its growth type will better choose how to direct its financial and intellectual capital to make the most of limited resources. Knowing the growth approach that best fits a company’s value proposition, capabilities, strengths, culture, and market opportunities is key to long-term success. Where do you fit? Companies with aggressive growth goals — and access to the capital they need to fund their goals — may find their success as Investors. Although Investors can be anything from greengrocers to software developers, they tend to be at the upper end of the middle market: 47 percent earn between $100 million and $1 billion in annual revenue. They also boast the highest rate of year-over-year revenue growth. At 11.5 percent, Investors’ average rate of growth is more than double that of companies that invest less aggressively. Investors are scalers. They are most likely to put resources toward the full spectrum of growth-producing activities, including introducing unique products and services and building additional plants or facilities. They grow primarily by expanding their market footprint — adding customers, territories, or both. They are more likely than other types of growers to enter new markets and to make acquisitions. Specifically, 55 percent of Investors say they are very adept at entering untapped geographic markets (organically or through acquisition), compared with 40 percent of all middle-market companies. This type of expansion is also a hallmark of the fastest-growing companies of all types. Investors must also be good at marketing. All the best-performing middle-market companies distinguish themselves through excellent sales-force management, but marketing is a skill that comes into special prominence when companies open up new territories, where their brand is not likely to be known and their network not likely to be deep. Although growth through investment can lead to rapid and impressive results, it is not for those who are faint of heart or short of cash. Companies that choose this path cannot be risk averse. They are characterized by high economic confidence: Given an extra dollar, companies in this group are the most likely to immediately put it to work rather than set it aside for a rainy day. Investor companies are the least opposed to taking on new debt or opening a new line of credit in order to finance their investments — and, indeed, are the hungriest for capital to fund the investments that drive their growth. This partly explains why they are the most likely to have private equity investors, who are less risk averse. Daseke Inc., the leading consolidator of flatbed and specialized trucking businesses and the only national public company of its type in North America, is an Investor whose annual revenues grew from $30 million in 2008 to $1.6 billion in 2018 by carefully seeking out and strategically acquiring the best-run businesses in its niche. This approach has opened up new markets, resulting in a network of autonomous, complementary operating companies honeycombed across the United States. Acquiring the best of the best isn’t always easy. Or cheap. But Daseke has demonstrated the patience it needs to stay true to its growth strategy. CEO Don Daseke seeks out only what he calls “companies that don’t need fixing,” and whose management teams agree to stay on for at least five years post acquisition. These requirements mean that the companies Daseke targets typically aren’t for sale. Convincing them to come on board can take years — time he is willing to spend. We have identified three distinct types of company personalities that enable certain companies to grow faster than the middle market as a whole, and learned what gives them an especially sharp edge. Some businesses are constantly striving to be first with the next new thing. About two out of 10 middle-market companies earn more than 20 percent of their revenue from products or services introduced within the last three years. We call these the Innovators. Innovators come from every industry, not just, as one might expect, the tech sector. Indeed, retailers are heavily represented in the middle-market Innovator cluster. As with Investors, market expansion is the principal driver of growth for Innovators, but this group pursues expansion primarily via innovation. Specifically, what sets Innovators apart is that they use their latest offerings or improved products, services, and solutions as the primary means of increasing sales to both new and existing customers and, thus, as their avenue into additional markets. Most Innovators introduce at least one offering every year to grow market share. As a result, Innovators realize 9.4 percent annual revenue growth on average, compared with 6.5 percent growth for less innovative firms. For middle-market companies of all types, it’s important that innovation and investment be programmatic — that is, that R&D be a function with a regular budget, not just a capability that’s switched on for a new project and switched off after it is developed. Innovators take this further: For these companies, innovation is the navigator, pointing out the way in which they will grow (whereas for Investors, the navigator is the target market). Although Innovators have the same growth appetite as Investors, they are more constrained in terms of resources. They’re younger. They’re smaller. They are the least likely of the three growth types to plan to take on new debt or open a new line of credit in order to finance expansion. In effect, Innovators substitute intellectual capital for financial resources — doubling down on the ingenuity that creates new offerings and ways to serve customers. As Innovators get bigger and richer, it may be that their growth profile will evolve so it is more like that of the Investors — but until then, they’re living by their wits. Varidesk LLC, a manufacturer of standing desks and other office products and systems, is an example of an Innovator that’s aggressively capitalizing on ingenuity: The organization has realized revenue growth of more than 30 percent annually for the past three years. Varidesk has more than 200 products and prototypes in the pipeline that it plans to launch through 2020. Indeed, since manufacturing the very first Varidesk sit–stand desk in 2012, the company has grown its product line to more than 100 active office products. It has delivered those products to 130 different countries and 98 percent of Fortune 500 firms, and works with customers in 30 different nations on a daily basis. The company offers a whole suite of interlinked innovations that are crucial to its success. Coming up with new products is one important capability, but the company also continually updates existing models and the processes developed to deliver them and looks to streamline everything from digital marketing to warehousing and distribution. Companies that lack the appetite for an ongoing, aggressive pursuit of more customers in new territories — either through acquisitions or through ongoing innovation and introduction of products and services — are not automatically doomed to mediocre growth. Indeed, the research reveals a third type of superior growth model. Efficiency Experts, like the other growth types, can be from any industry, but are most commonly found in retail and wholesale trade and the financial sector. They outperform their peers by focusing on better processes, a more productive workforce, and, perhaps most important, a formal, long-term growth strategy designed to guide performance. For this group, the “formal growth strategy” factor carries 71 percent more weight in the growth equation than it does for the middle market as a whole; it is the factor through which the other growth drivers pass on their way to growth. Cost efficiency weighs more heavily into this group’s growth equation and has a strong relationship with formal growth strategy. Efficiency Experts use cost control as a source of investment capital, funneling the money they save from operations into the kitty they invest in order to grow. Efficiency Experts also differ from the other types in the way they manage human capital. They are the only type of company for which developing staff has more weight in the growth equation than attracting talent. They build the skills they need from within, and, as a result, are less likely to cite talent shortages as a problem. Although companies that grow through efficiency prioritize the need to on-board top managerial talent and maintain a high-performance management team — a team that presumably has the capabilities and expertise to drive efficiency from the top down — they are also willing to invest heavily in training and education along with career path development, strategies that are embraced by the fastest-growing businesses in all three categories. As a group, Efficiency Experts are most likely to save cash instead of investing it. Their annual rate of revenue growth is lower than those of Investors and Innovators (7.4 percent compared with 11.5 percent and 9.4 percent, respectively). 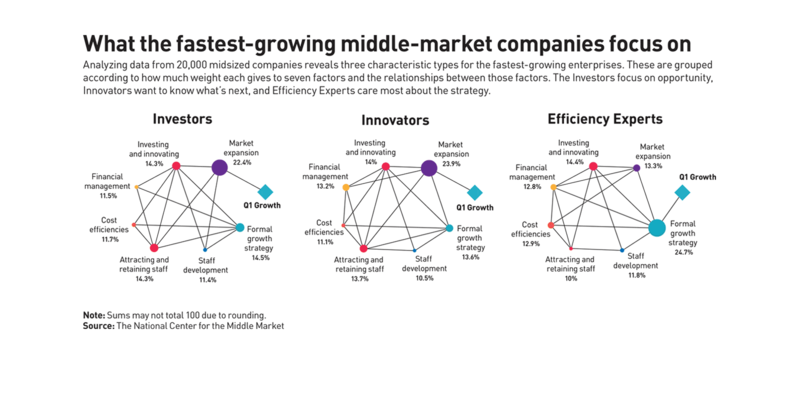 But these companies outperform less-efficient organizations, and the middle market as a whole, illustrating that much growth can be achieved by companies that can focus internally and maximize the velocity, return, and efficiency of the human, financial, and physical assets they already have. Signature Consultants, a national IT staffing firm with more than $100 million in sales, is an example of a firm that has significantly outpaced its peers, historically growing at three times the industry rate by emphasizing efficiency. The company ties departmental budgets to company growth. Sales, general, and administrative budgets are allowed to grow by no more than half the company’s overall growth rate. This creates what Signature executive vice president Geoff Gray and chief operating officer Mark Nussbaum refer to as cultural mechanics that drive even greater efficiency. Employees are highly motivated to improve processes, eliminate waste, and cut costs in order to drive higher profits, which are ultimately invested back into the business, creating additional opportunities and benefits for employees. What’s the opportunity? This question animates Investor companies. What’s new? This question ignites the imagination of Innovators. What’s the plan? This question engages Efficiency Experts in finding the best route to growth. Understanding their organization’s strengths and culture, choosing which of the three growth models fits best, and then focusing heavily on the factors that drive growth within that chosen model provides leaders of midsized companies with a sound framework for achieving their objectives in an accelerated time frame. Our research reflects results over a period of economic expansion when both interest rates and inflation were low. But when external factors outside a company’s control are less than ideal, it can help executives to stay focused on what they can influence and what they do best. By understanding their company’s identity and how it can be used to achieve long-term and sustained growth, leaders can avoid distractions and keep their businesses moving in the right direction, regardless of what’s going on around them. Thomas A. Stewart is executive director of the National Center for the Middle Market at Ohio State University. Formerly the chief marketing and knowledge officer of Booz & Company (now Strategy&, PwC's strategy consulting business) and editor-in-chief of Harvard Business Review, he is a contributing editor of strategy+business. His most recent book, coauthored with Patricia O’Connell, is Woo, Wow, and Win: Service Design, Strategy, and the Art of Customer Delight. Jeannette R. Gatchell is a writer who has been associated with the National Center for the Middle Market since its inception. She works with companies and nonprofit organizations in a range of industries, including business services, retail, energy, and healthcare.